경주 배동 삼릉은 경주 남산의 서쪽 기슭에 동서로 3개의 왕릉이 나란히 있어 붙여진 이름으로, 밑으로부터 신라 8대 아달라왕, 53대 신덕왕, 54대 경명왕 등 박씨 3왕의 무덤이라 전하고 있다. 무덤은 모두 원형으로 흙을 쌓아올린 형태를 하고 있다. 신덕왕릉이라 전해오는 가운데의 무덤은 1953년과 1963년에 도굴 당하여, 내부를 조사한 결과 굴식돌방무덤(횡혈식석실묘)임을 확인하였다. 무덤에는 돌방 벽면에 병풍을 돌려 세워 놓은 것처럼 동·서 양벽의 일부에 색이 칠해져 있는데, 이것은 본격적인 벽화는 아니지만 벽화가 그려지지 않은 경주의 신라 무덤에서는 처음 발견되는 것으로 주목되는 자료이다. 색은 붉은색, 황색, 백색, 군청색, 감청색으로 되어있고, 12폭으로 되어있다. 경주 배동 삼릉의 주인공이 신라의 박씨 3왕이라 전하고 있지만 확실한 기록은 없고 신라 초기의 아달라왕과 신덕왕, 경명왕 사이에는 무려 700여년의 차이가 있어 이들의 무덤이 한곳에 모여있다는 사실은 받아들이기 어렵다. 또한 신라 초기에는 이와 같은 대형무덤 자체가 존재하지 않았었다. 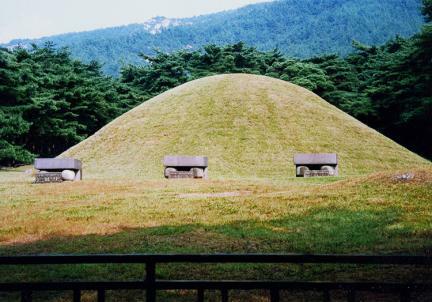 The three royal tombs, called Baedongsamneung (literally; three tombs of Bae-dong), are located on the lower west edge of Namsan mountain, Bae-dong, Gyeongju. The dead buried here are presumed to be the 8th king of the Silla Dynasty, King Adalla, the 53rd, King Sindeok, and the 54th, King Gyeongmyeong. While they are all said to have had the surname Park, there are not any documentary records making clear who the occupants of three tombs are, moreover the gap between the time of King Adalla’s rule and those of King Sindeok and King Gyeongmyeong is about 700 years so the likelihood that they all had surname Park may be hard to believe. 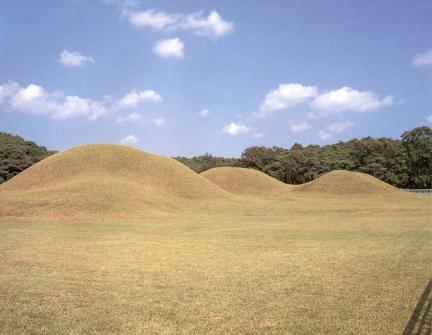 Also, some experts believe there would not have been such a large royal tomb in the earlier days of the Silla Dynasty. All the tombs are circular in shape and made of of clay. The middle one, the tomb of King Sindeok, was robbed twice, in 1953 and 1963, and according to research findings, its style is that of a stone chamber tomb. The decoration partly colored lacquer on each of the east and west walls as if to make stone walls look like folding screens. 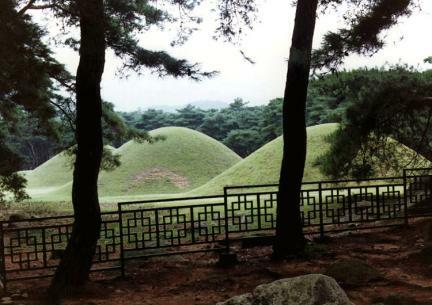 It is a very noteworthy site in spite of not being typical, having pictures of inside walls, since these were the first Silla Dynasty tombs to be discovered in Gyeongju, and the first to be excavated never seen before. The colors on the walls are red, yellow, white, navy blue and soft blue.